The Unlimited Motion Palm Protector/Carpal Sleeve is designed with a medical grade mineral oil gel pad that contours to the palm and wrist area. Gel absorbs shock and provides great fall protection for hands for both goalies and figure skaters! This product is washable and reusable. 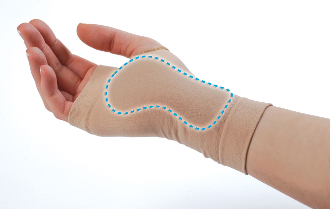 Anatomically designed gel pad molded to elastic sleeve contours to the shape of the palm. Also used for placement directly over carpal tunnel post-operative scar area. Great for fall protection on hands while skating! Sold as 1 pad, not in a pair.